Known locally as ‘the orchid field’, this unique site consists of two adjoining wet meadows, Le Noir Pre and Le Clos du Seigneur, that jointly provide one of the last remaining strongholds of the Jersey or Loose-flowered Orchid. This rare flower can also be found in some parts of Guernsey, but doesn’t grow anywhere else in the British Isles, which makes it all the more remarkable to find blooming in one place in such great abundance. In total there are 32,000 orchids at the site, with plant counts conducted every two years. In addition to the Jersey Orchid, eagle-eyed botanists will also be able to spot Southern Marsh, Common Spotted, Heath Spotted and Pyramidal Orchids, which grow here during the peak flowering season of May to June, when the meadows erupt in a riot of spectacular colour. Between the orchids, there is a wide variety of other wild flowers, including Ragged Robin, Yellow Bartsia, Common Knapweed and Tufted Vetch, playing host to flourishing insect life, such as the distinctive Orange Tip butterfly and the Emperor dragonfly. Now carefully managed by the National Trust for Jersey, the meadows are opened to the public for just a few weeks during the flowering season, when it is also possible to book a place on a guided tour on an annual open day. If you are not lucky enough to see Le Noir Pre’s orchids in full bloom, it is worth making the trip to visit the Eric Young Orchid Foundation at Victoria Village in Trinity. First established by botanist Eric Young and opened to the public in 2001, the foundation is home to one of the world’s finest collections of orchids, which are housed in a purpose-built nursery and display house. Sark’s less obvious beauty lies underneath its Gouliot headland on the west coast. In a series of vast mystical caves accessed via a narrow cliff path (and a short scramble), the subterranean world exits onto a short pebble beach. Visitors are advised to explore these caverns only with an experienced guide to minimise risk of injury as some climbing is involved, and the caves are affected by the tides. For divers, Sark is considered one of the best scenic locations in the British Isles thanks to its craggy coastline, interesting marine life and huge tidal range. The Gouliot’s Jewel Cave, so-called owing to its rainbow scheme of beadlet anemones, sea squirts and sponges decorating the cave walls, is an underwater spectacle. Those intending to visit on foot are obliged to wait their turn at low tide. Once inside, the way is easy to navigate. Anyone wanting to explore more of Sark’s cave systems, should head north to the Boutique Caves, thought to have been used by 18th-century smugglers for goods storage. From the beach a 200ft-long tunnel leads into a deep chamber that would have offered a perfect hideaway for stashed barrels and cases. Concerned for the future of the world’s most endangered animals, world-famous author and naturalist Gerald Durrell had a bold vision to create a stationary ark, where animals in need of protection could be kept and bred. The result was the beginning of the Durrell Wildlife Conservation Trust – an international charity based on Jersey, that has gained a reputation for its pioneering conservation techniques. Today the charity works in some of the most threatened environments on the planet, focusing on the rarest species and the most fragile habitats. Visitors wanting to see the work in action can visit the wildlife park, situated in 32 acres of park and farmland in the Parish of Trinity, four miles north of St Helier. During a day exploring the park and learning about the Trust’s ongoing projects, look out for some of the world’s most endangered animals from as far afield as the Galapagos Islands, India, Madagascar and the Caribbean islands. Among the wide variety of amphibians, reptiles, mammals and birds on display, the most striking include golden poison-dart frogs, komodo dragons, Sumatran orangutans and Sunda wrinkled hornbills. With the charity undertaking such important work, it makes it all the more remarkable that Durrell selected the small Channel Island of Jersey to provide its base, with the wildlife park now firmly established as one of the island’s most popular attractions. Children particularly appreciate the chance to get up close to some of the smaller creatures, while learning about their needs and natural habitats. Accessed via a quarter-mile-long causeway off Guernsey’s west coast, Lihou is a sanctuary for birdlife; a rocky islet inaccessible at high tide and home to no one but pairs of ringed plovers and oystercatchers, among more than 100 other feathered species. However there’s no denying that Lihou has witnessed human habitation, from as early as the 12th-century. The atmospheric remains of a priory stand as a reminder, thought to have been run by Benedictine monks from Mont St Michel in Normandy. Archaeological excavations have resulted in the finding of fragments of pottery, a sundial and a coin dating to the reign of Henry III. The monks themselves are not thought to have been popular with islanders owing to their insistence on ‘rights of wreck’ entitling them to booty washed ashore from vessels in peril. Centuries on, Lihou has become a favourite with overnight visitors staying at Lihou House, accommodation designed for groups and managed by Lihou Charitable Trust. People and wildlife respect each others boundaries on this tiny scrap of land, now a Ramsar site, an area recognised for its international importance by the UN Convention. As such, human activity is strictly monitored. Some places are roped off to avoid disturbance of sensitive habitats during nesting season, such as the Lissroy peninsula and two nearby islets of Lihoumel. Not only wildlife but plantlife thrives here too. Look out for the curiously named Yellow Horned Poppy, Sand Crocus, Least Adder’s Tongue and Sea Stork’s Bill. Don sturdy footwear if coming to Lihou via the causeway from L’Eree headland, and note the tide times to avoid risk of being cut off. As you pick your way across, study the rock pools created by the tide which shelter prolific sea life; the ormer shellfish is known to hide here. Those fortunate to stay overnight will experience a feeling of true isolation, the few twinkling lights of Guernsey the only sign of civilisation. Less than a mile off the coast of Alderney, the tiny Burhou is a highlight not to be missed on a visit to this peaceful part of the Channel Islands. An important breeding ground for seabirds, this minute island has restricted access, but during the summer months boat trips leave Alderney to ferry visitors on a journey around its shore. 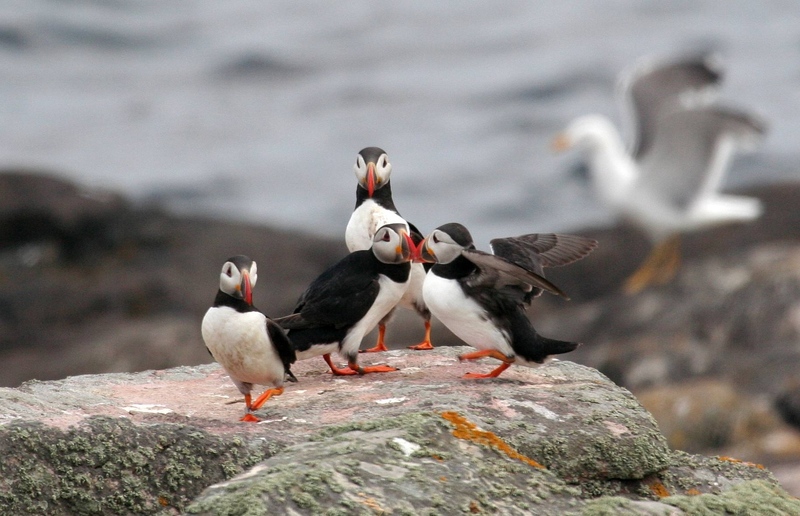 Puffin sightings are the main attraction, along with the Atlantic seal colony frolicking near Burhou reef. Only the island warden and the Alderney Wildlife Trust are allowed ashore while the puffins are in residence: the birds nest in burrows (often occupying ones evacuated by the rabbits they share the land with), therefore the terrain is not ideal. Another protected species is the black- backed gull, also seen in the vicinity living off the occasional unsuspecting puffin. Once the migratory birds have left at the end of July, the island opens to the public. Basic camping facilities at the island’s hut are available for up to eight people for a minimal fee – fetch the key from the Alderney harbour office. While enjoying Burhou’s seclusion, note the raised beaches indicating the former level of the sea bed of thousands of years ago. Several ships came to a bitter end off the Alderney and Burhou coastline, owing to high winds, the force of the current known as the Swinge between Alderney and Burhou, and treacherous rocks lying in wait. For those seeking more lavish accommodation, why not return to the Alderney shore and check into the Landmark Trust’s Fort Clonque, a holiday home with a difference jutting into the sea, and accessible via a causeway at low tide. Built in the 1840s for defensive purposes against the French, the granite fortress seems to blend with the very rock it sits upon. Uninterrupted views of the other tiny islands and sea stacks will evoke the feeling of being aboard a vast, static ocean liner.